Truro is an ideal place for a day trip with lots to do for all the family. Easily accessible from Penryn by car (15 minutes) or on the direct train line. Or make the day a true sightseeing adventure and take a boat from Falmouth, along the Carrick Roads and arrive in Truro in style! 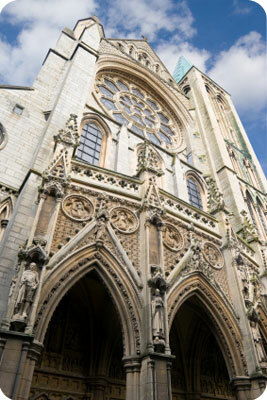 Truro Cathedral is the city's most recognisable feature, designed by architect John Loughborough Pearson. Finished in 1910 it took over 30 years to build. It is presently undergoing a 10 year £1.5 million renovation to restore the cathedral to its former glory. Years of sand and salt-laden wind channelled up the estuary has badly eroded the soft bath stone used for many of the carvings. Truro is also a great place for retail therapy, with a varied selection of shops catering to all of your needs. The indoor Pannier Market is a year-round covered market that hosts a variety of different stalls. A visit to Truro would not be the same without popping into the local Brewery. Skinners Brewery, located just a short walk from the city centre produces cask ales and bottled beers, the names of which come from famous characters from Cornish folklore. Brewery tours are available Monday to Friday, after which you can relax in their visitors centre and sample some of their famous Cornish beers.